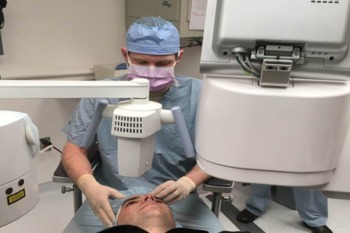 An innovative laser surgery, called collagen crosslinking, helps extend Airmen’s careers. The procedure corrects degenerative eye diseases, such as keratoconus and corneal ectasia. Those affected by the above conditions are not commissioned unless they receive a waiver; and, pilots are restricted from flying. The U.S. Food and Drug Administration (FDA) approved collagen crosslinking in 2016 for the treatment of progressive keratoconus. The procedure ends the degenerative process by stiffening and stabilizing the cornea. SDCB offers many programs designed to make better the lives of people living with vision conditions. Please contact us to learn more!